The spine consists of vertebrae (bones) that encircle and protect the spinal cord. These vertebrae are responsible for allowing the spine to move while protecting the spinal cord. To allow for movement and stability, the vertebrae interlock with one another with a joint on either side, one on the left and one on the right. The vertebrae are also separated from one another by intervertebral discs. The discs are made of a type of cartilage. The disc is made up of a soft, gel-like centre, called the nucleus pulposus, and this gel is kept in position by a tough outer fibrous layer called the annulus fibrosus. The vertebrae of the spine are further kept in position by an array of ligaments. Muscles attach to the vertebrae and nerves leave the spinal canal, formed by the vertebrae, through small openings called the neural foramina. There are 7 neck (cervical) vertebrae, 12 chest (thoracic) vertebrae, 5 lower back (lumbar) vertebrae and 5 sitting bone (sacral) vertebrae. The sacral vertebrae are fused into a single mass called the sacrum or sitting-bone. It is unusual for the thoracic (chest) spine to undergo wear and tear changes as it is stabilised by the rib cage that is attached to it. The cervical (neck) spine and the lumbar (lower back) spine, on the other hand, are subject to a lot of movement and this is where most of the wear and tear takes place. The lower part of the neck where it attaches to the rigid thoracic spine, stabilised by the ribs, is under a lot of biomechanical stress. The same is true for the lumbar spine. The bottom end of the lumbar spine is attached to the sitting-bone and the pelvis, which is rigid. The same types of mechanical stresses are found here as well as where it attaches at the top to the thoracic spine. This image is a side-on view of the spine. Note that the spine consists of vertebrae stacked on top of one another. There are 7 cervical vertebrae, 12 thoracic vertebrae, 5 lumbar vertebrae and 5 sacral vertebrae. The sacral vertebrae are fused into a single mass called the sacrum. There are three mobile curves; one is where the neck (cervical spine) and the chest (thoracic spine) meet. The lower curve is where the thoracic spine and the lower back (lumbar spine) meet. The third curve is a natural bend in the thoracic spine. There is one last curve, but this curve is fixed and does not move and is the sacral curve and consists of the sacral vertebrae that are fused together. The three mobile curves are important for the normal biomechanical balance of the spine. The integral stability and movement of the whole body is dependent on the spine, which acts as our central core. The second and equally important function of the spine is to protect the nerves that come from – and travel to – the brain and control all the functions of our body. This image is a back-to-front view of the lumbar spine. A: This is the spinous process of the first lumbar vertebra. B: This is the transverse process of the second lumbar vertebra. C: This is the joint on the right between the third and the fourth lumbar vertebrae. D: This is the spinal canal in which the spinal cord and spinal nerves run. E: This is the spinous process of the first sacral vertebra; it is fused to and continuous with the spinous process of the second and other sacral vertebrae. F: This is the second sacral hiatus. The second sacral nerve leaves the spine from here and extends to the pelvis. G: This part of the spine is called the coccyx and is located at the very bottom of the spine. This image is a side-on view of the lumbar spine. A: This is a spinous process of the lumbar spine. Spinous processes are present on the back of all vertebrae and are palpable through the skin. B: This is the joint between two vertebrae; each vertebra in the spine is joined to the vertebra below and above by these joints on the side. 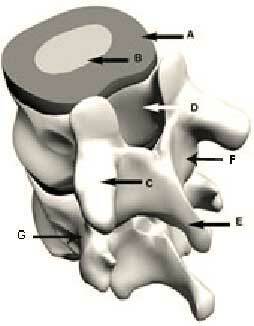 The intervertebral disc separates the vertebrae in the front. C: This is an intervertebral disc. These discs act as shock absorbers and allow for a certain amount of movement between the vertebrae. D: This is a foramen. It is where the nerves that come from the spinal cord exit the spine on their way to the legs. The nerves that run through these foramina control movement in the legs and allow sensation to pass from the legs to the spinal cord and from there to the brain. This image is a side-on view of the cervical and thoracic spine. A: This shows a joint in the cervical spine. These are the same joints that we find in the lumbar and thoracic spine. Their proper names are facet joints. B: This is a cervical spinous process. Note how both the joints and the spinous processes are smaller than in the lumbar spine. C: The black tube-like structure is the vertebral artery that runs through the side of the cervical vertebrae. This artery supplies the brain with blood. E: This shows the foramina through which the nerve runs to reach the chest wall. This is an illustration of a section of the spine. A: This is the outer, tough part of the intervertebral disc, called the annulus fibrosus. This is the part of the disc that tears when a patient develops a slipped disc. B: This is the soft, gel-like centre of the disc, called the nucleus pulposus. It is the component that thrusts outward in a slipped disc. C: This is the transverse process and is the part of the vertebra that sticks out to the side. In the thoracic spine the ribs attach onto these processes. D: This is the canal formed by the vertebrae in which the spinal cord and nerves run. E: This is the spinous process of the vertebra. F: This is the lamina of the vertebra. G: This is the pedicle of the vertebra.